as many others here, I'm new to the topic but interested in adding a modular synth to my workflow at home, as well as a live instrument (with the possibility to work with live-input from other instruments). I'm quite unsure yet, if I got the concepts of dealing with a modular synth right and I'm not sure, if I missed vital parts, so I'd be really glad about some feedback. A couple of things...first off, if you have a Maths in a simple build like this, you probably won't need that Quad VCO/LFO (which is more of an LFO than a VCO due to the "locking" tendency the oscillator cores have at audio rates). You'd be better off adding a second VCO (like something basic to detune against the Wavetable VCO, thickening up the sound) and some proper envelope generators for use with the VC Mixer, the VCAs, and your filter. Also, lose the uMixer here; you'll find that having a mixer with variable input levels is more helpful in a general-purpose instrument. Note, also, that your wavefolder can function as a mixer (with potentially interesting results!) for the two VCOs. Also, perhaps drop the Shelves for a more conventional state-variable filter, which should open up space for an output module to bring your levels down to line-level. You might also take out the multiple; in a smaller build, it's generally better to use inline mults or stackcables, leaving panel space for active functionality. Otherwise, this is pretty close to spot-on. Thanks for the feedback already. I really liked the sound of 'Shelves' as well as its flexibility, but maybe i found another option with the Polaris. I didn't realized that the wavefolder has two inputs, i was more amazed by the sound of it. I actually chose the Quad VCO because of its LFO features, but it's really taking a lot of space, so I switched it for a simple VCO and a proper double env-generator. originally I thought of the VC.mixer as my output mixer ,but probably it's better to have a proper one instead. Yeah, that's a lot more on-point. I'd even go one further step and delete the VC Mixer altogether, and swap in something with better functionality and space use with an Intellijel Quad VCA. Plus, the VCAs in that module can be swept from linear to exponential responses, making them useful for a wider set of possible signals. With that, you'd then have the space for a stereo output module of some type. Also, shift your A-119 to a side (left makes more sense) so you can avoid having an input cable running across your patchpoint field. But yeah, this is pretty close to where it ought to go. 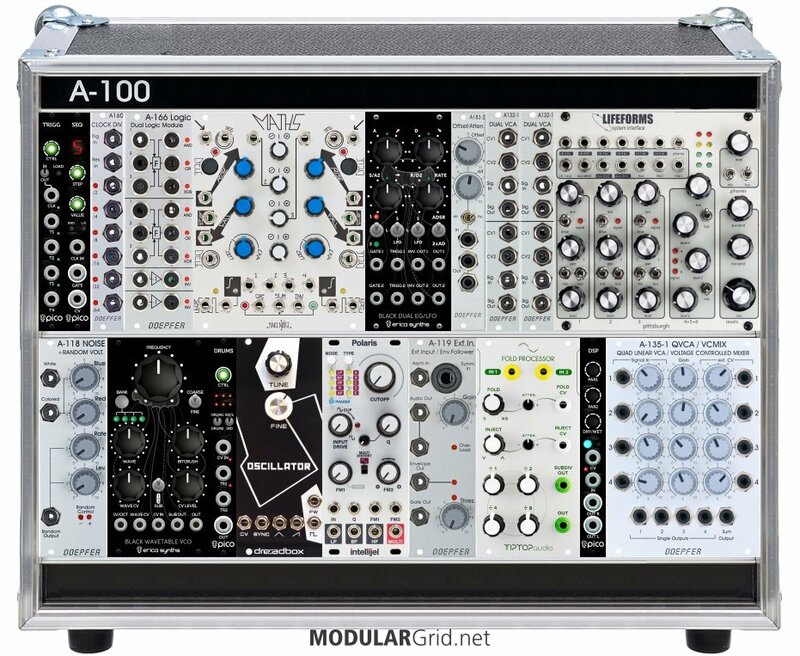 Didn't noticed the Intellijel Quad with the cascading structure looks really handy, thanks for that. And by dropping the mixer there is now space for a contact mic and another logic module. I'm not so sure about the Lifeforms mixer though, but it' seems to be the only stereo mixer I'm really able to get my hands on... Do you know an alternative? Hmmm...keep in mind that that contact mic is going to pick up every little bonk and scrape in the cab. You'd probably be better off using an actual one such as this: https://www.perfectcircuit.com/crank-sturgeon-classic-contact-mic.html and inputting it thru the A-119. The Ears is a great module...but it needs to be in a separate enclosure along with similar things, such as a small 4ms Pod or such, not where it'll pick up a lot of jostling around. As for logic: look into adding a comparator or two. These can be a lot of fun, as they output a gate when a given voltage threshold is crossed. That way, you can use an AND gate to let an LFO switch a sequencer clock on and off by outputting the AND to a linear VCA that's passing the clock, and by inputting the AND with the comparator output and another gate signal, such as from a clock divider/counter. That's just one example. Stereo mixer? Check Qu-bit's Mixology...gives you CV over level (VCA), pan, AUX send, plus you get a proper parallel FX send/return, and manual solo/mute switching. As of late, I think that might be the best bang-for-the-buck stereo performance mixer. Oh, I definitely have plenty of self soldered contact mics at home. The Ears is more of a nice option to have another input. and i really like the surfacing of it. Not too complex, unless you want it to be, as in the example of a "window" comparator. This is a little something from nuclear instrumentation circuits, actually, although there's now a couple of adaptations for Eurorack (such as Joranalogue's). In that case, you can have three gates...a window comparator allows you to set a voltage "window" with an upper and lower limit, either as two separate levels or via a "width" control. With that, you can have a gate for "below", "in" and "above", and you can also potentially allow for triggers to be outputted on each limit-crossing. Another cool device, which Ladik makes a cheap 4 hp version of, is a "discriminator". This is a specialized comparator that detects CV movement, allowing you to output a gate or trigger for "rise", "fall", "steady" and "any change". Ladik's actually the king of these little 4 hp specialized logic-state devices...worth a look! For smaller systems, I find the Intellijel 7U case neat, as you can use the extra 1U tiles to take care of the I/O module and some other features, such as an Audio/CV mixer (Quadratt), a step sequencer (Steppy) and other neat utilities. Keep in mind: only Intellijel 1U tiles will work in that case. The Erica EG/LG is neat, but you’ll get way more bang using a XAOC Zadar. Devoting that much space for a mixer in a system this size seems like overkill. There are smaller solutions from the Erica lineup (Fusion mixer is nice, as it has a pleasant tube overdrive and six channels). I would also suggest to have a more performance oriented sequencer, especially for live performances, same for your clock. Tempi is hard to beat with it’s UI and a Varigate is much better suited for per step changes. Manis Iteritas is great, but not well suited for per step on the fly changes, albeit loading from one of 16 banks can work. Rene is big, but really outstanding (MKI going for $350-380 now). The Trigger Riot could be a neat option as it’s a clock/gate/sequencer unit, well suited for performance in mind. Another nice thing about the Rene mkII + Tempi combo is that those two can work together in some exclusive functions that only that pairing is designed for. 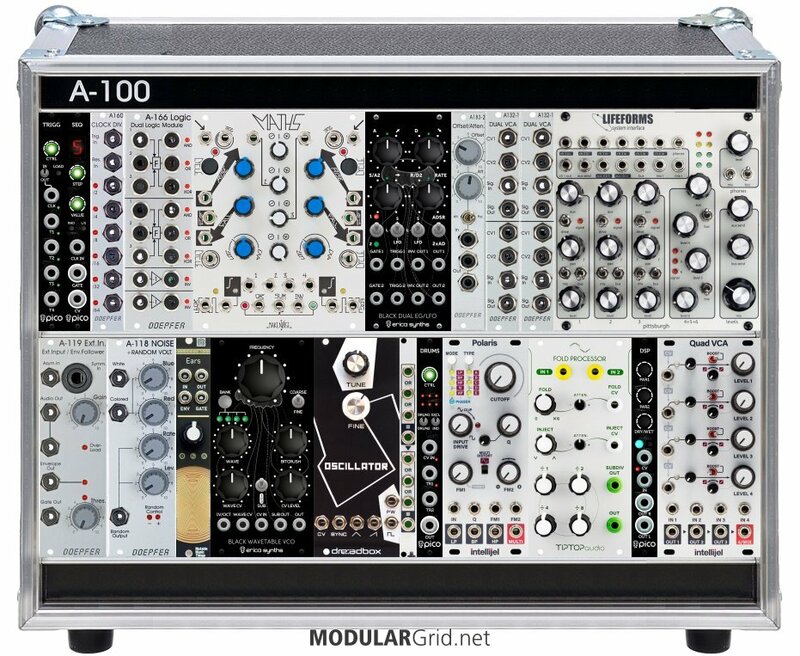 But yep, liquid_air is spot-on...going with a 7U Intellijel cab allows you to remove some basic functions to that 1U row, which then opens up more 3U space to functional modules. It also lets you move your external connections to the cab, taking a bit of spaghetti off of the jackfield itself. Thanks to you two. I don't really think I'm going to do any more changes on the setup because right now it has somehow reached my financial limit at the time. Especially the Intellijel case. It looks handy though but I right now it's way out. Regarding performability. I'm actually programming a sequencer right now, that generates CV and is connected via a Motu Audio interface. It's more or less an additional 10 channel VC-generator. I'm really thankful for your advice! The Blue Lantern Stereo Sir-Mix-A-Lot isn't bad. It has two stereo aux sends, two stereo returns, panning and mutes. I put one in my rack and don't mind it. It's inexpensive as far as mixers go. Happy Nerding and Roland also make decent mixers that also respond to CV for panning or panning/level depending on which brand you go with.